Recipes with a few ingredients, but a lot of flavor. Yesterday, I made one of Scott’s favorite desserts-buttermilk pie (recipe at ThatSweetAng). I’ve been on a mission to find new recipes that call for buttermilk so that I can use up what’s left after making the pie. 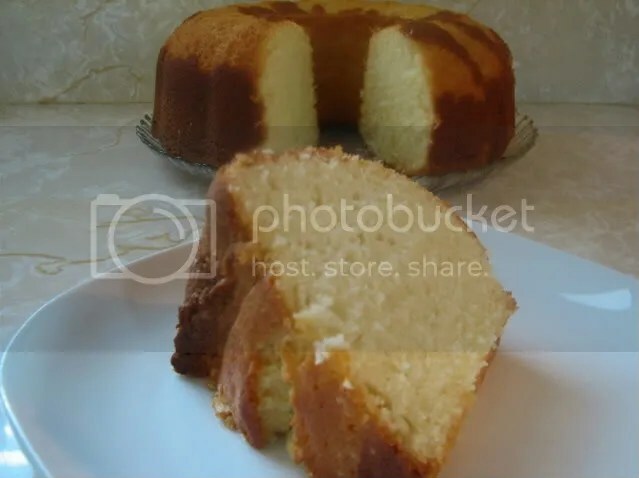 I found this pound cake recipe on All Recipes and had all of the ingredients so I decided to give it a try. This cake smelled wonderful while it was baking and tastes great. It did not take 90 minutes to bake- I took it out of the oven after 75 minutes and it might have actually been done at 70 minutes. This is an easy and good pound cake recipe. It is very moist and the meringue powder that I added made it perfectly high. I think I could actually take this home to my mom and she is the queen of pound cakes! Preheat oven to 325 degrees F (165 degrees C). Grease one 9 or 10 inch tube pan. Mix together the flour, baking soda, salt and meringue powder. Set aside. In a large bowl, beat butter with sugar. Mix in the eggs, one at time, beating well after each addition. Stir in the lemon and the vanilla extracts. Gently mix in flour mixture alternately with the buttermilk. Pour batter into the prepared pan. Bake in preheated oven for 90 minutes. Do not open oven door until after one hour. When cake begins to pull away from the side of the pan it is done. Let cool in pan for 10 minutes, then turn out onto a wire rack and cool completely. Wow – the texture of the pound cake looks great! This cake does look good enough to bring home to me! Thanks for the compliment! OH MY GOD THAT CAKE LOOKS DIVINE! WILL DEFINATELY TRY. OH MY GOD THAT CAKE LOOKS DELECTABLE ! WILL DEFINATELY TRY. Pingback: Little Miss Foodie Two Shoes » Blog Archive » What to do with the buttermilk..
Pingback: Little Miss Foodie Two Shoes − What to do with the buttermilk..